This weekend, I headed out to Portland, Oregon for the High Ed Web annual conference. Last year, it was in Buffalo, and it was my first time attending. I was new to the field, and new to the working world, and the heweb community took me in and gave me a huge professional hug, and a real one too. Of course, I was excited to head back to what many call “nerd camp,” not only to see my friends, but to explore a new city and meet new people. It started of with a 7am flight to Chicago, where I was on a connecting flight with some old (and new) friends from the northeast. I had only been to the west coast once before, and I forgot how hard jetlag can hit you. We landed at noon Portland time, but hit the ground running. Each moment was filled with something. 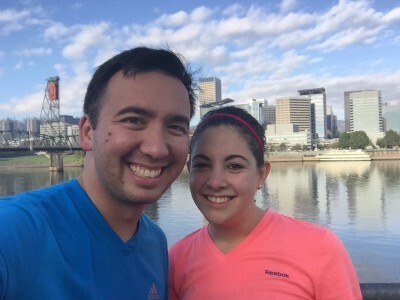 We walked for miles, ate Voodoo doughnuts, drank coffee…and beer. A lot of beer. We took TriMet across town, visited Powell’s books, and did I mention we drank beer? Aside from the social stuff (which I’ll get to later), the conference was, as always, a wealth of information. My fingers nearly fell off from live-blogging the conference with the fantastic Link Staff, but it means I got to sit in on some awesome sessions and effectively earn the “conference hangover” – that feeling you get when so much awesome surrounds you that you can’t see straight. My biggest takeaway, or golden nugget, wasn’t really in one specific session. The theme of success was collaboration and communication…and more importantly, collaboration because of communication. I saw it when staff was working with students, asking students what they want, plus cross-departmental communication and even collaboration for a large project. It seems like common sense, but what we need to be successful is simple…communication. The ladies at Penn State communicated with a variety of departments to form a MOOC on campus. Graphics, video, faculty, IT…it takes a lot, but what made a super successful MOOC at Penn? Communication. We’re an audience of web/marketing professionals, and were given a chance to learn about what it’s like to be an Admissions Counselor, doing everything from defining terms that we’ve never heard (like stealth applicant) to what a “funnel” is. The audience was wide-eyed, nodding and whispering “oh!” throughout the presentation. At the close, an audience member asked, “as an admissions counselor, what would your wish be for the web?” The response, “you guys are really good at making students click on things. Do that.” was hilarious, but accurate. We’re experts on the web, they’re experts at students. What’s the key to success? Communication. 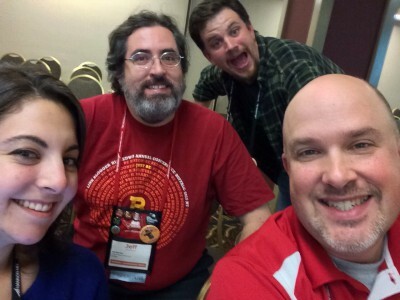 It wouldn’t be a post about heweb14 if it didn’t include mention of the Best of Conference winner, teaching us how to be human. Helpful ways to quickly sort through emails, be more mindful, and nice all stemmed from communication, too. Of course, being in Portland meant an awesome opportunity to venture around the city each day after the conference activities were over, and even before the conference started. My first two days in Portland were wide open because the conference kicked off Sunday night, but suddenly my agenda filled up with activities. I met some new friends right away, and we ventured around Portland – immediately checking as many “must-do’s” of the city off the list as possible. We headed to Powell’s Books – an amazing book store that we could have easily spent hours in. I restrained myself from buying anything, thinking about how stuffed my suitcase was. We also indulged in some hometown coffee, mostly to keep our energy up on the first day. The morning of conference registration, I felt like a true Portlandian and ran around the steel bridge loop. I’m convinced these bridges were originally built for runners and bikers, and then the engineers decided, “well, why don’t we just build a spot for cars, too.” The view was gorgeous, and I couldn’t get over how safe I felt, despite running over large bridges in downtown Portland. We made our own makeshift “brew crawl,” which not only served as a cool way to learn about the city, but an awesome pre-conference social event. I met a number of people for the first time, and it was nice to have new friends going into he conference. Speaking of social events, the heweb committee seriously pushed the envelope with the quality of social events during the conference. We had our own game rooms, karaoke lounges, bars, and oh…did I mention karaoke? I finally landed, jet lagged, but happy. I visited Powell’s, ate doughnuts from Voodoo, sang karaoke, got delicious sushi, traveled by public transit, tried some of the most interesting ice cream flavors I could never imagine (Pear and Bleu Cheese, for example), ate from a food truck, danced the night away, met new friends, and learned a ton. 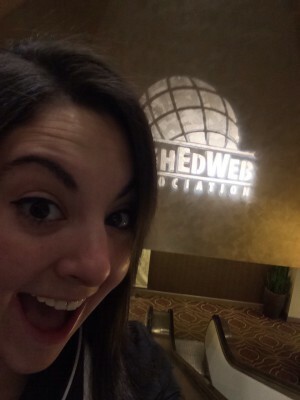 See you in Milwaukee, heweb15!